The Arch of Titus (Roman Emperor A.D. 79–81) is located in Rome on the east end of the ancient Roman Forum not too far from the Colosseum. The emperor Domitian (A.D. 81-96) built it soon after the death of Titus in A.D. 81. View looking west at the Arch of Titus from the east. Click on Images to Enlarge and/or Download. 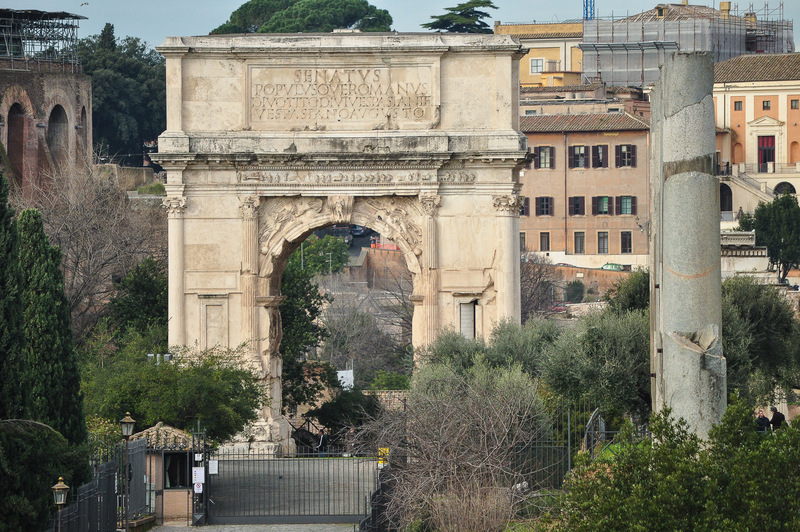 The arch commemorates the victories of Vespasian (A.D. 69–79) and his son Titus—particularly their putting down the Jewish revolt in Judea and the capture of Jerusalem in A.D. 70. It is well to remember that this commemorative arch was built by Domitian, to commemorate a triumphal parade of the previous emperor Vespasian and his son Titus who was the actual conquer of Jerusalem. On the south inner side of the arch, Roman soldiers carry the booty from the Jerusalem Temple in triumph into Rome—see end of blog for quote from Josephus. View looking southwest at the relief carved on the southern pier of the Arch of Titus in Rome that depicts the procession of booty taken from Titus’ capture of Jerusalem in A.D. 70. Click on Image to Enlarge and/or Download. From right to left note the representation of a Triumphal Gate with two chariot groups on top of it (enlarge the image to view details). To the left of this are two crossed (silver) trumpets taken from the Temple in Jerusalem. Faintly visible (enlarge image) is a representation of one of the tables that held the “show bread” in the Holy Place of the Temple. 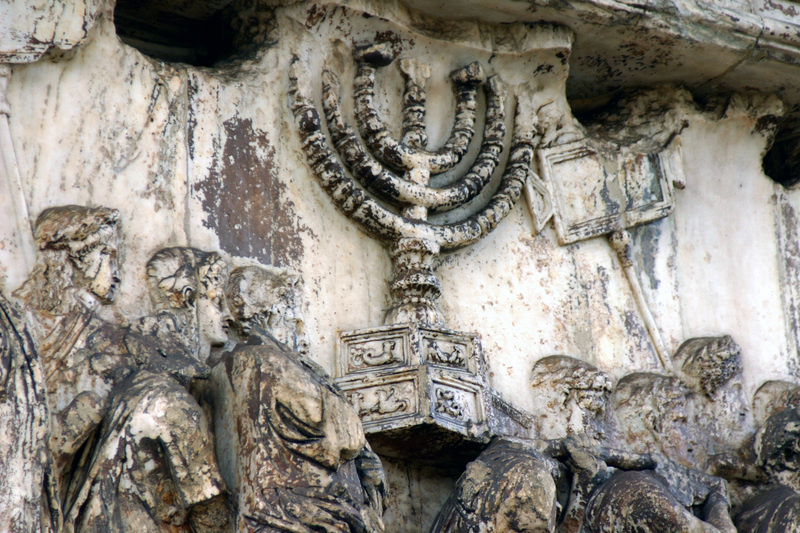 On the left side of the image one of the seven-branched candlesticks (menorah) from the Jerusalem Temple. This is one of the earliest representations of a menorah in existence! Also visible are several rectangular placards on poles. These probably were painted with inscriptions naming either cities or peoples conquered—or identifying the objects that were being displayed in triumph. One of the seven-branched candlesticks (menorah) from the Jerusalem Temple. Note the figures on its base! This is one of the earliest representations of a menorah in existence! What is the “Temple of Peace” you ask? We will take a look at that in my next blog. 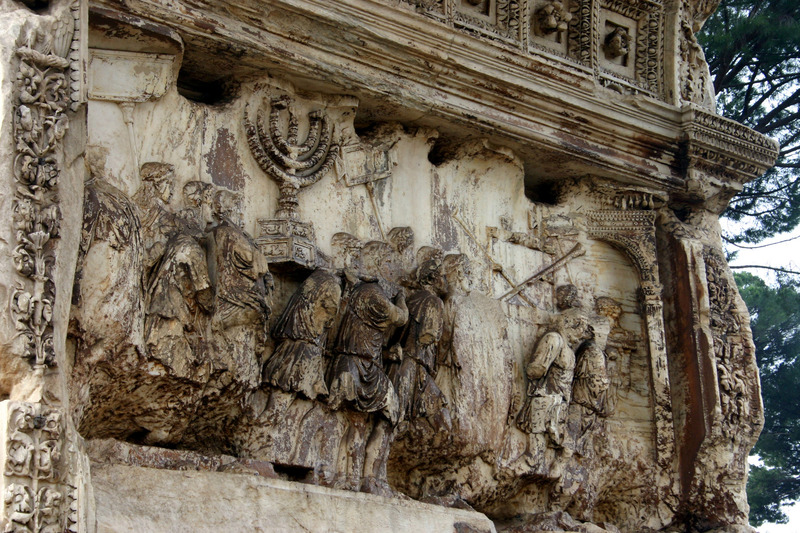 Click Here to view additional images of the Arch of Titus. And, the folk at Jerusalem Perspective have placed on line a 54 min lecture (with pictures) by Ronny Reich entitled “The Mikveh and Ritual Immerson in the Second Temple Period.” Ronny Reich is of course famous for many excavations—but especially at the Gihon Spring and the Pool of Siloam in Jerusalem. This is an informative lecture about the archaeology and literary sources that describe miqvaoth. You will want to have pen and paper at hand to take notes. Around 14:00–26:00 he describes the minimun requirements for a miqveh. And talks about miqvaoth discovered in the Jewish Quarter by Avigad and near the Temple Mount by Mazar. Also ones at Gamla (33:00), Jericho (41:45), Masada (48:20), and Qumran. I always wondered how they cleaned them and exactly how an otzar worked—here I found out. 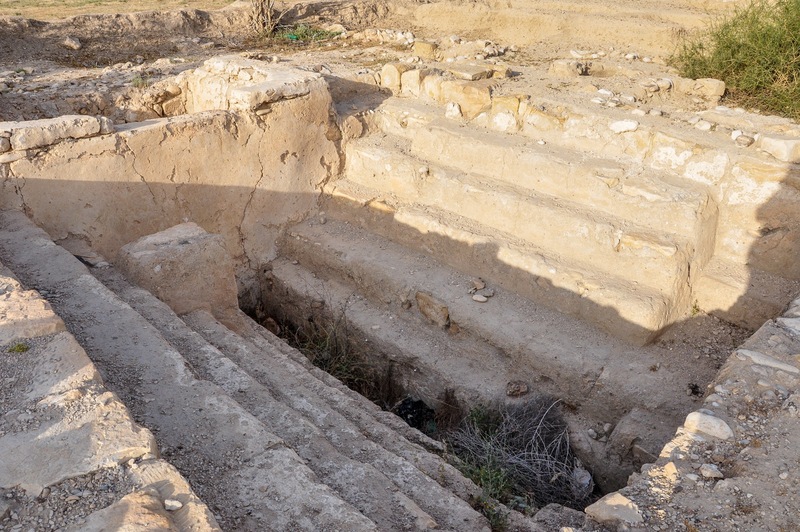 But remember, this is as of 2006, before the discovery of many additional ritual baths such as the ones at Magdala. Here are two miqvaoth samples from Jerusalem that are not discussed by Reich and one question (from me) from Jericho. 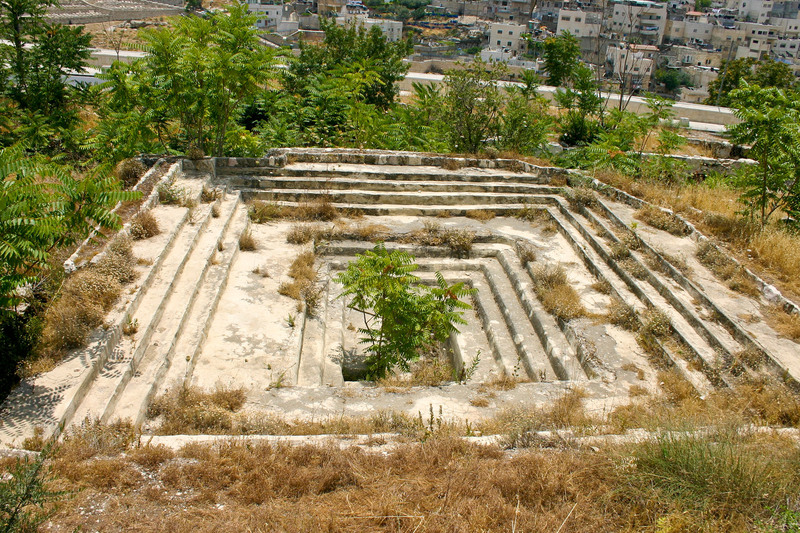 This ritual bath (miqveh) is located in Benjamin Mazar’s excavations south of the Triple Gate of the Temple Mount (Haram esh-Sharif) area. Ritual Bath recently discovered in the Rabbinic Tunnel Complex near the Western Wall. Note the steps that lead down into the ritual bath (miqvah). Our guide suggested that this ritual bath may have been used by the priests that served in the Temple itself. But, since it looks like it would have been difficult to immerse oneself in this bath/pool/basin, our guide said that an alternative view is that it was a place where ritual vessels were washed (purified). It seems to me that this bath/pool is very similar in design to the larger one that was found by Benjamin Mazar south of the Temple Mount. This large ritual bath is from the late Second Temple Period (New Testament era) and is located on the lower eastern slope of the Western Hill—west of the Temple Mount proper. My Question: is this a Balsam Processing Pool? It looks like one of the above Ritual Baths. Also, see here! Okay, from Jericho. Is this a Balsam processing pool? Or a Ritual Bath? This is a view of a pool that, according to the excavator, was used for the soaking of Balsam branches. The balsam plantations at Jericho were world famous and this precious commodity was shipped all over the Roman World. To harvest it I believe that usually not-too-deep slits were cut into the branches of the bush with either a sharp bone or piece of glass—never with a metal knife. The sap that came out was processed for its scent. Evidently, another method included the cutting and soaking of crushed branches, in a pool such as this, but I am not certain how that process actually worked. I am guessing that the finished product, although valuable, was not as good quality as that produced by the method described above. See Netzer, Ehud, and Rachel Laureys–Chachy. The Architecture of Herod, the Great Builder. Grand Rapids: Baker Academic, 2008, pp. 42–80. The above column was discovered while “cleaning out the nymphaeum” at Laodicea (Wilson, p. 251; see below). The search for the Late Roman/Byzantine Jewish presence in Asia Minor is ongoing. The above column attests to a Jewish presence at Laodicea but its relationship to the Christians there is ambiguous. To this untrained eye it looks like the cross was added to the menorah. Did this mean that Christians and Jews were peacefully coexisting at Laodicea? 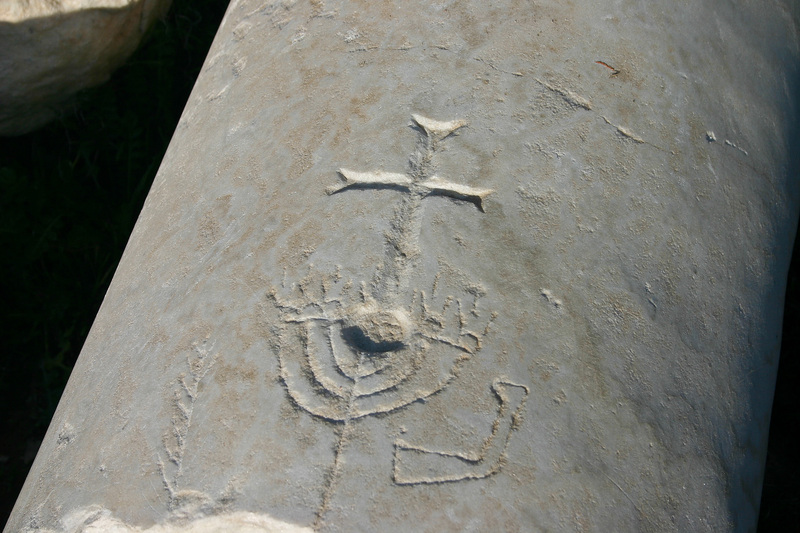 Or was this an indication of Jewish Christians there? Or that Christianity had “superseded” Judaism? To view additional Menoroth with a lulav see Hierapolis Tomb 148B, the steps of the Library of Celsus at Ephesus, the plaque from the synagogue at Andriace (Turkey), a square post at Umm el-Qanatir (Israel, Golan Heights), and the mosaic synagogue floor at Sepphoris (Israel). Menoroth with shofars are rather common. 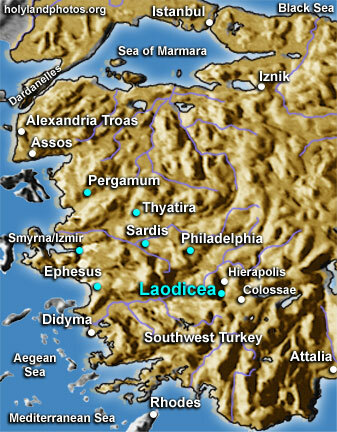 It is probable that Epaphras was instrumental in establishing the church at Laodicea, and Paul writes that his letter to the church at Colossae (only 8 mi. [13 km.] distant) should be read by the believers at Laodicea (Col 2:1). Paul also wrote a letter to the church at Laodicea (Col 4:16). This letter has not been discovered, although many scholars speculate that the book called “Ephesians” was originally addressed to the church at Laodicea. Mark Wilson’s Biblical Turkey — A Guide to the Jewish and Christian Sites of Asia Minor is the best up-to-date resource available on biblical sites in Turkey (amazon $35.35). We recently took the 80 minute guided tour called “Behind the Scenes of The Western Wall.” This tour is run by the same group that operates the much more familiar “The Western Wall Tunnels” tour. 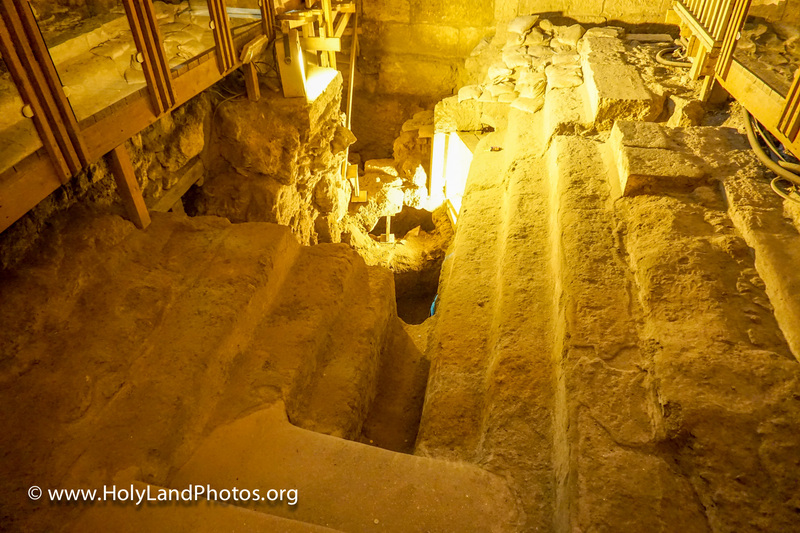 One of the interesting finds that we visited was a large ritual bath from the late Second Temple Period (New Testament era) that is located on the lower eastern slope of the Western Hill—west of the Temple Mount proper. View of the large stepped ritual bath from the Late Second Temple Period. Click on Images to Enlarge and/or Download. 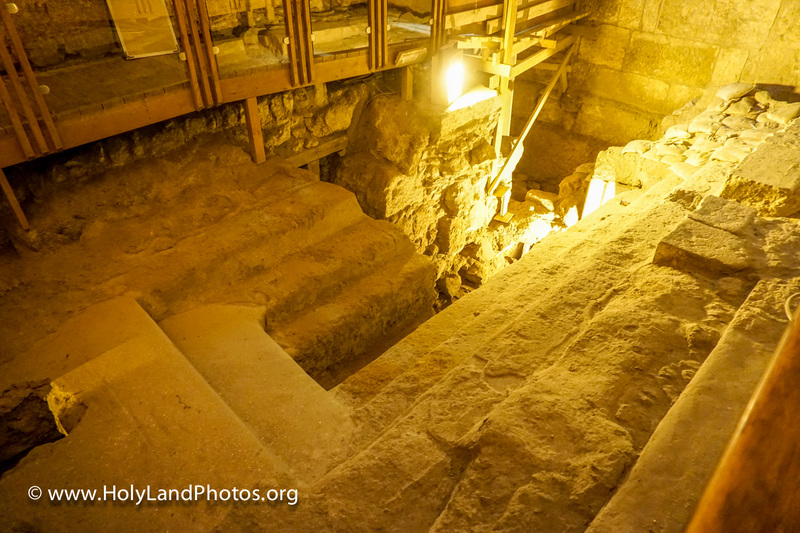 Note the steps that lead down into the ritual bath (miqvah). Our guide suggested that this ritual bath may have been used by the priests that served in the Temple itself. But, since it looks like it would have been difficult to immerse oneself in this bath/pool/basin, our guide said that an alternative view is that it was a place where ritual vessels were washed (purified?). It seems to me that this bath/pool is very similar in design to the larger one that was found by Benjamin Mazar south of the Temple Mount. For a earlier discussion of Mazar’s bath/pool/basin see here. For a view of a more typical ritual bath Click Here. Another view of the ritual bath/pool/basin at the Western Wall Excavations. Next time, a monumental room from the Late Second Temple Period (New Testament era). 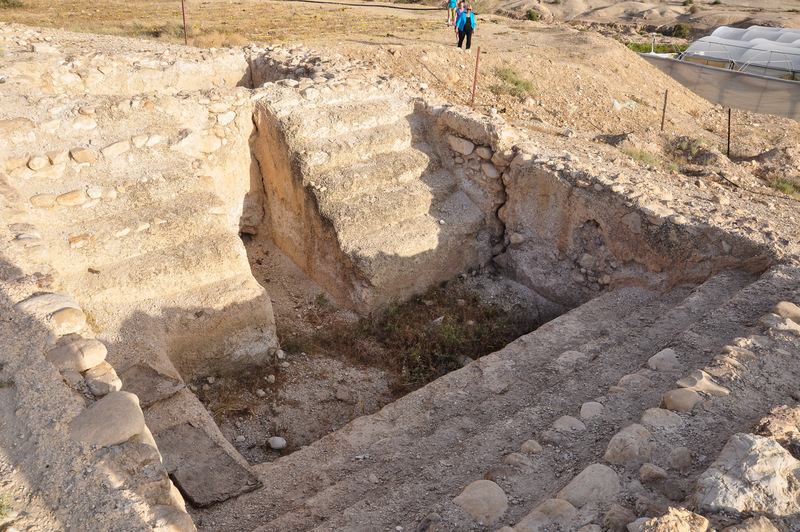 These baths look a lot like the so-called “Balsam Soaking Pools” at New Testament (Herodian) Jericho. This is a view of a pool at Herodian (NT) Jericho that, according to the excavator, was used for the soaking of Balsam branches. The balsam plantations at Jericho were world famous and this precious commodity was shipped all over the Roman World. See here for a more complete discussion of this pool/bath.